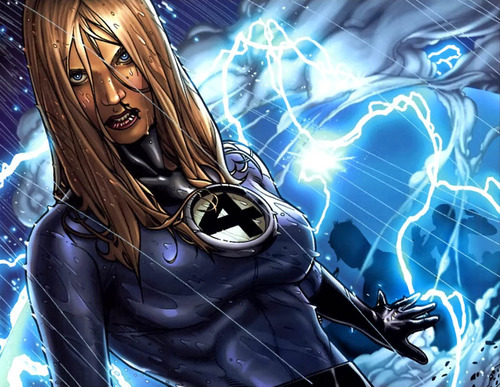 Susan "Sue" Storm Richards (also known as Invisible Girl, and later Invisible Woman) is a fictional Character, a superheroine that appears in comic books published by Marvel Comics. She was the first female superhero created by Marvel in the Silver Age of Comics. 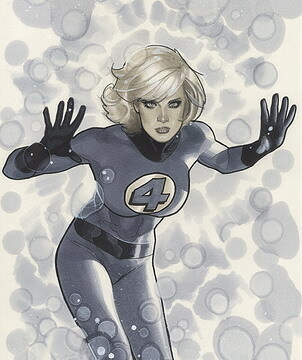 Like the other founding members of the Fantastic Four, Sue received her powers after being exposed to a cosmic storm. Her primary power deals with light waves, allowing her to render herself and others invisible. However, she can also project powerful fields of invisible psionic energy which she uses for a variety of offensive and defensive effects. Sue plays a central role in the lives of her brother, her husband, her children (Franklin and Valeria Richards), and her close friend Ben Grimm. An object of infatuation for Doctor Doom and, most notably, Namor the Sub-Mariner, Sue's passive invisibility power translated into her frequent deployment as a damsel in distress during the team's early adventures. 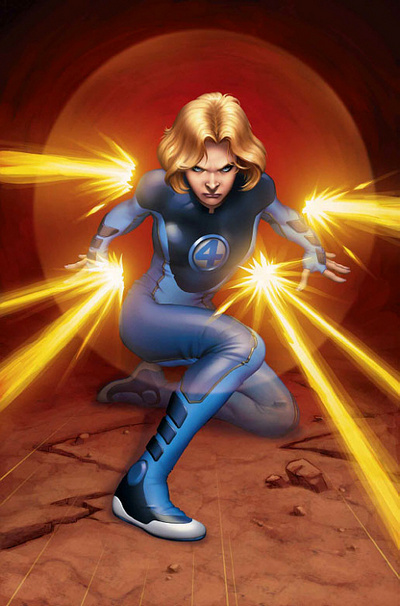 However, upon developing the ability to project powerful fields of energy, Sue Storm became a more powerful member of the Fantastic Four, and the team's second-in-command with a growing assertive confidence. 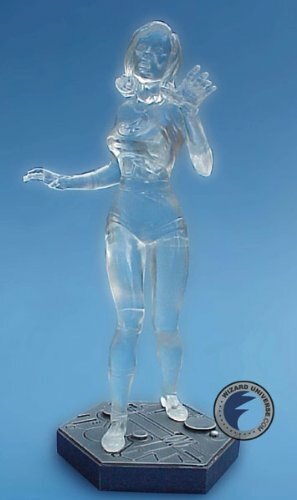 While Sue operated somewhat in the shadow of her hot-headed brother, Johnny Storm, and her brilliant husband Reed Richards in the early years, she is now the soul of the Fantastic Four and one of the premiere heroes in the Marvel Universe - More about Invisible Woman (Marvel Comics) Character Review...Keep reading !! The Invisible Woman is portrayed by Jessica Alba in the 2005 film Fantastic Four, and its 2007 sequel Fantastic Four: Rise of the Silver Surfer. As the Invisible Woman, Susan can render herself wholly or partially invisible at will. She can also render other people or objects invisible, affecting up to forty thousand cubic feet of volume. She achieves these feats by mentally bending all wavelengths of light in the vicinity around herself or the target in question, and she does this without causing any visible distortion effects; she also directs enough undistorted light to her eyes to retain her full range of vision while invisible. She can also use her powers to turn objects of similar size that are invisible by other means visible. Sue can also mentally generate a psionic field of invisible force apparently drawn from hyperspace, which she manipulates for a variety of effects. Most commonly, Sue generates near-indestructible invisible force fields around herself or other targets. She can vary the texture and tensile strength of her field to some extent, rendering it highly rigid or as soft and yielding as foam; softer variations on the field enable her to cushion impacts more gently, and are less likely to result in a psionic backlash against Sue herself (in rare cases, sufficiently powerful attacks on her psionic fields can cause her mental or physical pain). She is also able to make her shields opaque or translucent like Milk glass to effectively block variations of light such as laser-beams, or make them semipermeable to filter oxygen from water though the latter is mentally taxing. Sue can shape her psionic force fields into invisible constructs, usually simple shapes such as barriers, columns, cones, cylinders, darts, discs, domes, platforms, rams, ramps, slides and spheres. By generating additional force behind her psionic constructs, Sue can turn them into offensive weapons, ranging from massive invisible battering rams to small projectiles such as spheres and darts. She can generate solid force constructs as small as a marble or as large as 100 feet (30 m) in diameter, and her hollow projections such as domes can extend up to several miles in area. By forming one of her force fields within an object and expanding the field, Sue can cause her target to explode. She can also travel atop animated constructs such as ramps, stairs, slides, columns and stepping discs, enabling her to fly. She can manipulate the energy of her force fields around other objects to simulate telekinetic abilities. It has been said on numerous occasions, including by the Fantastic Four's greatest opponent, Doctor Doom, that Sue is the single-most powerful member of the quartet and she is one of the only beings able to rupture the shell of a Celestial. She is capable of generating and manipulating multiple force fields simultaneously. This power is only limited by her concentration; once she stops concentrating on a field, it simply ceases to exist. Susan is also a competent hand-to-hand combatant and martial artist, having been trained by Iron Fist, and having received additional coaching from both the Thing and She-Hulk. Her unparalleled sense of compassion and common sense makes her a natural-born leader, and she usually acts as the Fantastic Four's second-in-command, usually taking over complete leadership of the team during Mr. Fantastic's absence. The Fantastic Four (1994) - Sue is portrayed by Rebecca Staab in the 1994 film adaptation, The Fantastic Four. This film portrays Sue very much as she was in the original comics; shy, reserved and infatuated with Reed. The film concludes with Reed and Sue's marriage. Fantastic Four (2005) - Sue is portrayed by Jessica Alba in the 2005 film "Fantastic Four". Sue, a brilliant scientist, leads Victor Von Doom's Department of Genetic Research. She is dating Von Doom at the beginning of the film. Immediately prior to the arrival of the cosmic storm which grants her the ability to manipulate light (allowing her to disappear and generate semi-visible force fields), Victor proposes to her: she turns him down. Unlike in other media, Sue was not able to render her normal clothes invisible which resulted in an embarrassing moment when Sue tried to disrobe to sneak through a crowd, only to reappear while still in her underwear. Although her powers are influenced by her emotions, she manages to control her abilities during the team's climactic battle with Von Doom. Sue accepts Richards' proposal of marriage at the end of the film. In "Fantastic Four: Rise of the Silver Surfer", Sue Storm's wedding to Mister Fantastic is interrupted by the arrival of the Silver Surfer. When her powers are temporarily switched with Johnny's, Sue burns all of her clothes off and, upon switching powers back, is left laying completely naked on the sidewalk outside her building, photographed by the crowd, muttering "Why does this always happen to me?". Sue reminds the Silver Surfer of the woman he loved back on his homeworld. This association, and the friendship with Sue which follows, leads the Surfer to turn against his master, Galactus. While attempting to shield the Silver Surfer with a force field, Sue is stabbed through the chest by a spear created by a cosmic-powered Doctor Doom, and she dies in Reed's arms. However, Silver Surfer uses his cosmic powers to heal Sue, tarnishing himself in the process. Before leaving to confront Galactus, Silver Surfer tells Reed to treasure every moment with Sue. Reed and a kimono-clad Sue are married in a ceremony in Japan at the end of the film, moments before jetting off with Ben and Johnny to save Venice from sinking.